Leading garage door manufacturer Garador provided their giant 18 tonne delivery vehicles and drivers for a day to help get 500 cyclists riders and their bikes up to the north Somerset coast for the start of a major charity event. The cyclists were taking part in the West Country’s challenging Coast to Coast Cycle Challenge to raise funds for the Dorset and Somerset Air Ambulance. Thanks to Garador, all the bikes and riders were transported up to the right place at the right time for the start. The Challenge covers a cycle route from the North coast of Somerset to the South coast of Dorset, and with so many participants, the logistics of making sure everyone started and ended safely with their bikes was enormous. 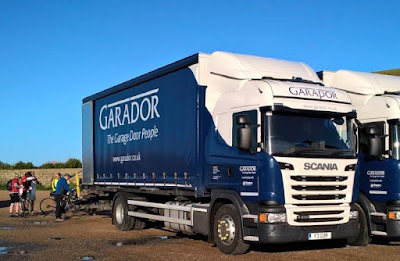 Bill Sivewright, Chief Executive of the Dorset and Somerset Air Ambulance, said Garador’s support for the day was a critical part of its success “We are very grateful to Garador for providing the vital cycle transport between the start and finish areas of the event,” he said. “Their support is really appreciated by riders who would struggle otherwise to even enter. “We have received some fantastic comments from participants who have all agreed how well the event was organised and run on the day,” he added.